Another post about veganism today because, apparently, the first rule of Vegan Club is to talk about Vegan Club all the time. It seems there are some stereotypes about vegans that absolutely hold true. Today’s article, though, hopefully gives me a chance to dispel a couple of other clichés about vegans and the vegan community. It’s becoming increasingly outdated, but there has been a previous propensity in the media to represent everyone who sticks to a plant-based diet as not being able to dress themselves in an aesthetically pleasing fashion – previously it was assumed all vegans were hippies in unwashed clothes and sandals; in recent years, the movement has become associated with hipsters and their embrace of knowingly terrible clothes, sported with a knowing sense of irony. Thankfully, as more and more celebrities have embraced the movement, we’re increasingly getting to see the truth about the impacts of veganism on one’s sartorial tastes – like meat-eaters, vegans cross the whole spectrum when it comes to fashion, encompassing those with a keen eye for clothing (i.e. JME) to those with a dubious clothing palette (Will I. Am). Just because we leave animals off or our plates and out of our clothing choices, doesn’t make us any better or worse dressers than the average person. It is possible to dress well without bringing leather, wool or any other animal product into our wardrobes, its just a matter of taking the time to consider alternatives. A second notion I hope to dispel over the course of this post, is the notion that veganism is a middle-class movement, or that it requires a lot of money to indulge in such a fad. Surely, the logic goes, it takes a special element of financial privilege to make certain every item of clothing one purchases fulfils a certain ethical criteria? Writing this post from my home in the middle of a council estate in Bradford, I can ensure you this is not the case. As with a vegan diet, ensuring one remains vegan in their clothing choices simply requires a touch of planning and foresight – doing so can also mean one can dress well without breaking the bank or any ethical code. 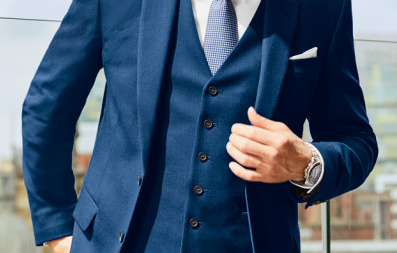 So, for a would be snappy dresser wanting to maintain the confidence that a decent suit imbibes the wearer with (without eschewing vegan principles or budgetary limitations), it’s not particularly difficult to find retailers which meet these requirements through just a small amount of research. Take, for example, Simon Jersey. 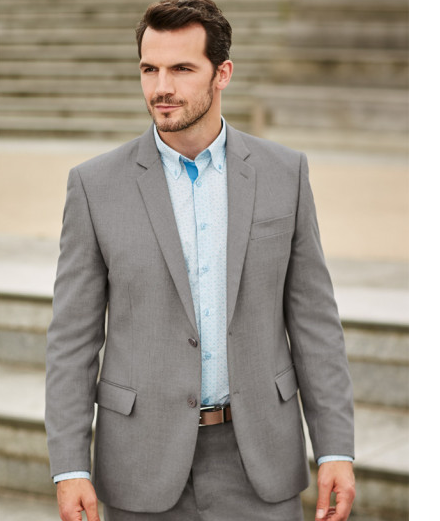 Although the company are not, specifically, a vegan retailer, it doesn’t take long to find handsome suits in their collections which fit each of the aforementioned criteria and specifications. Perusing their online store leads me past their Premium collection (which, unfortunately for this writer, contains wool), and through to their Contemporary (mid-range) and Essentials (value range) selections. In the former category, it’s possible to piece together a two piece suit made of vegan-friendly materials (polyester, viscose and lycra), as worn by Team GB, from a trifecta of debonair colours at a cost of just shy of £120. The designs are sleek, slim-fitting and sport an unusual, albeit fetching, narrow lapel which give a modern twist on the classic suit, and are a perfect rebuttal piece to anyone who assumes vegans all dress like Nigel Planer in The Young Ones. Even better, for those on a tighter budget, is the fact their Essentials range makes it possible to piece together a two piece, formal suit for just a touch over £50. Even for people who don’t wear formal attire on a regular basis, its an ideal purchase to stock one’s wardrobe with and to break out when required for weddings, job interviews or, if you’re that way inclined, your Instagram feed. There’s very little reason not to have a sophisticated black suit in your possession if you can, and the fact these suits are 100% polyester also makes them 100% vegan. By taking the time to research the clothes you put on your body, you can make a real impact in reducing the harm you cause to the earth and other, non-human animals. That you can do so without impeding on your stylistic flair means you can look good as you feel good, and also shatter some stereotypes along the way. Hopefully this article has been useful to you but I have to dash – I’ve got some lentils in the kitchen to attend to. Some stereotypes, it would seem, are actually pretty accurate all things considered.